The use of a trade name of a manufacturer or a contractor in this report does not constitute an official endorsement or approval of the use of such commercial hardware or software or service. This report may not be cited for the purpose of advertisement. 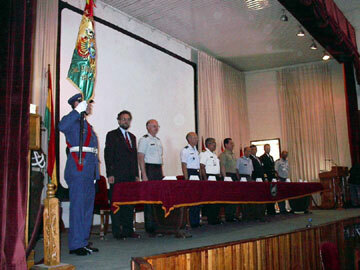 The Fourth Annual US-Bolivian National Security Strategy Exercise was conducted 2126 October 2001 at the Command and General Staff College of the Army in Cochabamba, Bolivia. The participants were the students of the Escuela de Altos Estudios Nacionales (School of National Higher Studies, or EAEN). The exercise is a computer-assisted role-playing simulation designed to challenge EAEN students to find long-range strategic solutions to the national security challenges faced by Bolivia. The exercise was conducted iteratively across three plausible national scenarios differing in key aspects of Bolivian society (civil unrest, corruption, narcotrafficking, poverty, unemployment, inflation, public health and education, etc.). Student role-players represented the president, all ministers and vice-ministers of the government, leaders of the armed forces and national police, international organizations, and, most importantly, a Threat Group composed of narcotraffickers, illegal coca growers and violent political opposition groups. Each exercise iteration centered on strategic actions and reactions of the Government and Threat during the current and a future multi-year period (2001-2002, 2002-2004, 2004-2007). An adjudication committee composed of student leaders and USSOUTHCOM facilitators resolved each periods conflicting policies and actions. A quantitative picture of the state of the economy and society of Bolivia at the end of each period was generated with the aid of a comprehensive dynamic simulation model of Bolivian society developed at USSOUTHCOM for this purpose (NationLab 2001). During the preparation phase leading up to the exercise, students of the three campuses of the EAEN critically studied the long-range planning and policy formation process of each ministry of government. They also learned the intricacies of the interagency coordination and the role and influence of major regional and international organizations such as the World Bank, the International Monetary Fund (IMF), the World Trade Organization (WTO), the Organization of American States (OAS), and the Southern Cone Common Market (Spanish acronym Mercosur). The beginning of the each period of the exercise coincided with a new administration, so those roles could rotate among the students. The courses of action (COA) developed during the three administrations were different in significant and interesting ways. The first administration, in power for just one-year, began the gradual introduction of a system of universal taxation  the first ever in Bolivian history  but found itself in a violent confrontation with the Threat Group, which brought the government to the very brink of collapse. The second administration attempted to appease the violent opposition by ceasing the eradication of coca fields. It continued the tax reforms of the previous administration, and introduced laws that created a professional civil service  also a first in Bolivian history. Coca harvests and cocaine production increased dramatically during this period, as did road blockades and violent opposition. In reaction, the third administration ended the policy of appeasement and cracked down hard on the cocaine industry and the political opposition, thus attracting international criticism for violations of civil liberties and human rights. The third administration also instituted further measures against corruption, including annual audits for every government agency. By the end of the exercise the economy and society of Bolivia were just beginning to recover from a very difficult six years of turmoil. This was the fourth NationLab exercise in Bolivia, but the first in which the EAEN invited foreign observers. These included military and police representatives from Mexico, Peru, Paraguay, and the Inter-American Defense College, located in Washington, DC. The exercise was judged to be a success by senior Bolivian officials, US Military Group, and Distinguished Visitors from noted countries and organizations. Bringing together all three campuses of the EAEN into one unified exercise was particularly successful, as evidenced by the enthusiasm and very high standard of performance exhibited by the participants. This successful three-school unified exercise paves the way for: (1) future National Security Strategy (NSS) Strategic Gaming efforts on a bilateral and possibly a regional basis; and (2) expansion of NationLab exercises to other senior level schools throughout the USSOUTHCOM area of responsibility. The authors wish to recognize the invaluable assistance given by many people. Most noteworthy, the continued support given by MG Gary Speer, USA, Acting Commander in Chief, US Southern Command (USSOUTHCOM), and Brigadier General Robert D. Bishop, USAF, new Director of Strategy, Policy and Plans, SCJ5, on this exceptional Theater Security Cooperation (TSC) event. We acknowledge USEMB Country Team Bolivia for their continued backing. Moreover, this project could have not been accomplished without the support particularly of Colonel Paul Kappelman, USA, Commander, US Military Group (MILGP), Bolivia, and LTC Pedro Rosario, USA, USA, Chief, Chief, Army Section. Also, the support furnished by Ms. Monica Velazco, Ms. Gloria Zeballos, and other members from the MILGP Administrative staffs who diligently ensured all of our logistics package was in place. We wish to also thank the US Small Business Administration Southeast Florida for its exceptional information furnished in previous years to the EAEN. This has allowed the school advisors and students to understand the complexities, and important requirements associated to small business operations and how government policies support the same. Our gratitude also goes to the EAEN authorities that provided excellent logistics throughout the entire planning, coordination and execution phases in calendar year 2001. We want to acknowledge the personal attention and hospitality given throughout the year by Captain Gonzalo Sanchez, EAEN Commandant, Colonel Ariel Avila Pino, Course Director La Paz branch, and Gen. (Ret) Carlos Macias Kraljevic, Senior EAEN Advisor. Also, our thanks to BG Remy Ramirez, Commander of the 7th [Airborne] Division and Sub-Director of EAEN Cochabamba, Col Miguel Idaurre, Chief of Staff, 7th [Airborne] Division, and Col (Ret) Oswaldo Claros Camacho, Course Director, Cochabamba. Our appreciation to BG Justo Gareca, Commander 8th SOF and Jungle Warfare Division and EAEN Sub-Director, Santa Cruz, Col (Ret) Manfredo Steinbach, Course Director, Gen (Ret) Jose Reyes Perez Ortiz, Senior Course Advisor, and Gen (Ret) Jorge Rodriguez, Senior Advisor, Santa Cruz de la Sierra. Special thanks to all of the other military and civilian advisors who complemented the efforts of the EAEN leadership in accomplishing this massive undertaking. Special mention is also warranted for Mrs. Barbara Cobb, who became our note taker during daily presentations used to support discussions during the Adjudication Committee sessions, and who has diligently offered her editing expertise in the preparation of this report. Also of special mention are the efforts of Engineer Carlos Vaca Guzman, EAEN Alumni President of Santa Cruz Campus who for the second consecutive year volunteered his time and resources to support USSOUTHCOM. Mr. Vaca Guzman was instrumental with our Distinguished Visitor (BG Robert Sullivan) visit and related coordination. We must acknowledge the excellent translation services offered by Ms. Leonor Schoening of El Salvador who delivered all necessary documents in a timely and accurate manner, and without cost to USSOUTHCOM. Equally important, a special thanks to all EAEN personnel, officers, non commissioned officers, civilians, faculty advisors, administrative and technical support, for their wonderful kindness and attention to the SCJ5-DDAS. During the exercise the authors appreciated the efforts of the Bolivian government is undertaking under the leadership of President Jorge Quiroga, who replaced President Hugo Banzer because of his terminal illness. President Quirogas current policies served as the foundation to many discussions, and possible courses of action to attack Bolivias challenges. We remain grateful to his government and, Bolivians in general, for allowing us for the fourth consecutive year to participate jointly with EAEN to address the challenges of the vicious cycle  Narcotrafficking, Corruption, and Poverty. Lastly, not an acknowledgment, but an observation on the challenge of eliminating the coca industry, corruption and poverty from the Bolivian society, we wish to thank the citizens of this wonderful country who continue to meet the challenges with dignity and high esteem. To test alternative long-range strategic national policies for breaking the nation out of its endless cycle of poverty, corruption, and narcotrafficking. Breaking this vicious cycle has been identified by the EAEN as the primary objective for Bolivian national security. To bring together, in one unified exercise, all the students from the three EAEN campuses so that they can meet each other, strengthen the ties between schools, and prepare for future interaction in positions of national policy-making importance. To open up the exercise to distinguished visitors from other countries, so that they can observe how the careful and neutral uses of a computer-assisted NationLab exercise. And so that they can understand the needs of a nation facing social and economic crises, which threaten its national security, can promote creative brainstorming and problem-solving among advanced students who are likely be in future positions of great responsibility within that nation. 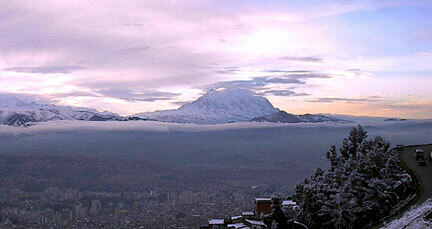 This exercise was the fourth in a series of exercises, which have been held with EAEN, Bolivia. 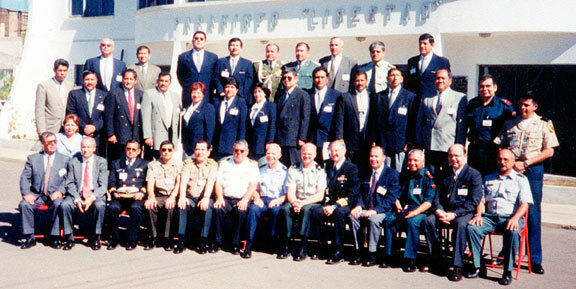 Since 1998, USSOUTHCOM has provided assistance with exercise planning and execution, and computer support with the NationLab:Bolivia simulation model. Those in charge of the exercise in Bolivia are responsible for setting the agenda and focus of the simulation, as well as providing much of the national data on which the computer modeling is based. The USSOUTHCOM facilitators strive to provide policy guidance and reasonably accurate modeling based on international studies of social and economic dynamics, in a knowledgeable but neutral fashion. 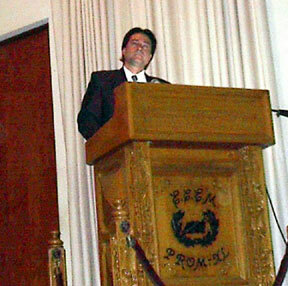 The goal is to encourage Bolivian post-graduate students, drawn from military, police and civilian professional positions of power and influence within their nation, to role-play executive ability and formulate possible courses of actions against Bolivias vicious cycle of narcotrafficking, poverty, corruption, and civil unrest. As these students rise to future leadership positions, they will be in a position to apply lessons learned regarding past and present policies that impact their country: e.g. corruption, coca industry eradication efforts, human rights abuses, realistic foreign economic assistance and investment, infrastructure development and improvements, small business development, universal taxation, etc. The General Situation on which the exercise was predicated was prepared by the faculty and advisors of the EAEN. It concentrated on the vicious cycle that perpetuates narcotrafficking, corruption and poverty. The eradication efforts undertaken by Bolivia over the past several years to reduce the production of illegal coca, and to discourage the production of precursors and processed cocaine, have been very successful and effective. Nevertheless, some residual narcotrafficking continues to persist with those involved in this industry relocating coca production, finding new transport routes, etc. Furthermore, even though domestic production of coca has been diminished, Bolivia is now experiencing resurgence in the transshipment of cocaine through the country. These sources originate from providers in other countries, e.g. Peru, to illegal markets in Brazil, Argentina and Paraguay, which eventually are either consumed domestically or shipped abroad to the U.S. and Europe. Despite Bolivias efforts to provide alternative crop development, former coca growers are not finding it possible to make a living just on alternative crops, and have formed a coalition under the leadership of Evo Morales to demand the right to grow more coca. Hot spots for continued illicit coca growth include the Yungas and Chapare regions. During the week of this exercise, the cocaleros in the Chapare were engaged in harassing and injuring eradication workers, holding demonstrations in Cochabamba, and threatening a major road blockade for the 6th of November. This road blockade had the capacity to paralyze economic activity in the region. At the time that the NationLab exercise began, Bolivia was facing several immediate challenges: the need to cope with the threat of civil unrest and blockade; the insufficiency of the alternative crop system to provide adequate income; and serious political challenges which might weaken the current Coca Zero eradication policy. Bolivia is in the process of determining the main causes of corruption in its government and civil service, which have been integral parts of the system for many generations. There are two prongs to the corruption problem: 1) built in factors which lend themselves to the development and sustenance of corruption and 2) a prevailing attitude that this is the way things are, so why change. Students at the EAEN were interested in both aspects of this problem. Some wanted to take a firm moral stance against the problem of corruption, urging for transparency and accountability by all individuals and institutions in all dealings on moral principle. Others were more interested in some of the practical problems, which foster the practices of corruption, not only in Bolivia but in many other nations as well. All agreed that there is a high level of distrust in the government by the people, and that this is a threat to the working and well being of the nation and the achievement of its goals. Civil service, military, and police appointments are not independent of the political system. Political parties appoint many civil service positions. Furthermore, the positions are not well paid, and in order to make a decent living, income must be supplemented. There is no broad based universal tax system, which could be used to pay for governmental employees, thus making it difficult to break out of the loop of supplementary payments as described above. Anti-corruption laws are seldom fully enforced, allowing those who steal from the public to frequently get away with their crimes. This decreases public morale and trust in the government and the justice system even further. There is no adequate national system of support for the development and marketing of crops, exports, or small businesses in general. Many Bolivians are either forced into the informal economy, or choose to engage in illegal activities such as illegal coca production, narcotrafficking, and the black market to make a living. This means that regulations are often ignored, and bribery and corruption flourish. Because so many people understand the deficiencies of this system, and have some sympathy with those who are stuck in poverty and cant get by without bending the rules in some way, infractions are often ignored, and the cycle of corruption continues. Bolivia is one of the poorest nations in South America. More than 1.5 million people live in conditions of extreme poverty, without access to the minimal requirements for food and clothing. Additionally, about 40% of all Bolivian households still lacking some basic necessities, such as water and sewer services, safe housing, or access to public education. Health services exist, but are inadequate to cover all needs particularly in the rural sector. In Bolivia, the index of human poverty is directly related to the index of human development. One of the clearest relationships is between the ethnic factor and poverty: indigenous people are disproportionately represented among the poorest and more depressed sectors of the nation. Thus, attention must be paid to reducing poverty and encouraging development in these populations. Other important factors which contribute to economic disruption and poverty in Bolivia include large migration from the countryside into the cities, under-employment, unemployment, crime, malnutrition, marginalization, the lack of competitive international marketing for domestic produce, corruption, and narcotrafficking. This was the first exercise in which students from all three branches of the EAEN came together to hold a unified exercise. In previous years, individual exercises had been held separately in La Paz, Cochabamba, and Santa Cruz. 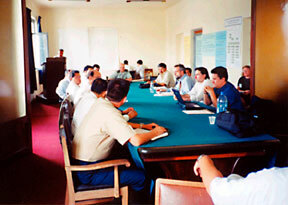 The directors and faculty of each campus, as well as the USSOUTHCOM advisors, felt that it would be advantageous to bring all three branches together in one venue, creating an exercise with approximately 100 players and allowing for invitations to be extended to distinguished national and international observers. EAEN students, who are already involved in both governmental and civilian positions of influence, ranging from military and police officers to lawyers, doctors, economists, social workers, architects, city planners, engineers and other professional leaders, do not often get the opportunity to make contact and work with each other. It was felt that this [first time] unified exercise would give an opportunity to strengthen personal and professional ties, and a sense of a common national interest in problem solving. Each campus required its students to research the various ministries and organizations which they were to represent during the simulation. Then they were placed in teams, which deliberately commingled students from each campus. The spirit of competition enhanced the efforts of each campus, and students came to Cochabamba with an especially impressive level of preparation and comprehension for their tasks. The US Military Group assisted in transporting students by Narcotics Affairs Section (NAS) C-130 air transport to the Chimore-Chapare region prior to the commencement of the exercise. At that location, military and police were currently in a hostile confrontation with the cocaleros and farmers of the region. This gave the students first hand experience underlining the theme of the exercise, and gave them the opportunity to meet each other in a challenging situation. By the time the exercise got under way on Monday, the students already felt that the situation was no longer just a simulation, but based on a reality which they had seen at first hand. Their enthusiasm and dedication to their task was evident. BGEN Robert Sullivan, representing Major General Gary Speer, ACINC, US-SOUTHCOM. COL Cliff Graham from the Inter-American Defense College (IADC) in Washington, D.C.
Dr. Loren Cobb, Aetheling Consultants and Northrop Grumman. Assisting with computer simulation and technical support was CPO Lee Friedlander. The objective of every NationLab exercise is to provide a unique opportunity for future leaders of a nation to evaluate the likely long-range effects of proposed and potential national policies in the context of a computer-assisted role-playing exercise. The exercise scenario was developed by the EAEN faculty, based on current conditions and problems within Bolivia. All roles, including the critical opposition and threat roles, were filled by Bolivians, using their own experience and extensive advance preparation as their guides for choices and actions. Policy outcomes were resolved by unanimous vote of the Adjudication Committee, which included all principal role players as voting members. The NationLab:Bolivia computer simulation model was used to determine quantitative policy outcomes wherever possible, based on open-source data on the conditions and dynamics of Bolivian economy and society. This model has evolved with substantial feedback and constructive criticism from EAEN students and faculty over the last three years. This design is notable for its ability to attain the exercise objective in a manner that gives all participants substantial confidence in the outcomes of their policy choices. Each of the three days of the exercise was dedicated to a separate presidency. As a general design principle, each presidency would face a somewhat different set of problems and challenges, and each would have its own distinct philosophy for action and policy creation. The policy outcomes and results achieved by each presidency would become the initial conditions faced by the next presidency, and additional problems and challenges would be inserted, as specified by the scenario script. As a consequence of this principle of scenario design, the conditions that are seen within each presidency evolve out of what has transpired in the previous presidency, are strongly influenced by new events that were scripted in advance, and are shaped by the overall agenda and philosophy of the current president. The purpose of role-playing in the exercise is to expose students to the pressures of strategic policy-making at the national level and the complexities, challenges and stress related to the interagency process. All major roles of government are played by students of the school, as well as the roles of non-governmental and international organizations, leadership of the political opposition and the narcotrafficking industry, and the World Bank and IMF. The school apportioned roles so that students from all three campuses were in each ministry. Special attention was given by the EAEN to the selection of each days President and the opposition group. Students worked on, researched and developed their ministries in detail in the weeks prior to the exercise, and their high degree of preparation was evident as the exercise progressed. In the morning, students in each ministry or council met in separate rooms to develop policy. These policies were then presented to the President and his Cabinet for revision and approval in the late morning. After lunch, the President briefed the entire exercise on the policies to be pursued by his administration over the next time period. This presentation was immediately followed by the Threat Group, which presented its plans with respect to impeding the government, blocking transportation routes, fostering the growth of the cocaine industry, and, as it turned out, developing terrorist tactics to achieve their objectives. The key ministries represented in the exercise were the Office of the Presidency, Finance Ministry, Ministry of Justice and Human Rights, Defense Ministry (COSDENA), Drug Interdiction (CONALTID), and the Health and Social Services Ministry (CONAPSO). Each student was assigned either to a ministry, a Threat group (the violent opposition, cocaleros, or narcotraffickers), a non-governmental organization such as the Red Cross, or an international organization such as the World Bank. CONAPE (National Economic Policies Council)  is responsible for the coordination of national economic and financial policies. CONAPSO (National Social Policies Council)  is responsible for coordinating the national social and human development policies. COSDENA (Supreme National Defense Council)  is responsible for coordinating the national external and internal security policies. CONALTID (National Fight against Illegal Drug Traffic Council) includes members from several ministries: Foreign Affairs and Culture, Finance, Agriculture and Rural Development, Defense, Health and Social Security. It is responsible for policies for controlling drug abuse and illegal drug traffic. The Threat Group (also known as Amenaza or Red Cell) was chosen to represent existing opposition groups in Bolivia, which currently seek to change national policy through the use of petitions, demands, demonstrations, strikes, blockades, harassment, and sometimes violent force. Bolivia is concerned this year about the increasing threat of narcoterrorism on a global level, and there has been much discussion about avoiding the potential Colombianization of Bolivia, in which a local group, similar to the Colombian Revolutionary Armed Forces (FARC), could cause major disruption and civil unrest. The Threat Group was charged with selecting strategies of narcoterrorism that would cause maximum trouble for the government. Structure of the Government of Bolivia, Executive Branch. The purpose of this committee, meeting at the end of each day of play, was to decide the outcome when policies were in conflict. This committee consisted of the current President, Finance Minister, Minister of Defense, leaders of CONAPE, CONAPSO and CONALTID, and leaders of the threat groups. The committee was co-chaired by Drs. Gonzalez and Cobb.Members of the committee were asked to set aside their loyalties to their respective ministries and councils, and instead to realistically assess the probable outcome of conflicting policy decisions based on their knowledge and experience of Bolivian government and politics. The committee was asked to make its decisions unanimous by vote, implying that all differences in opinion had to be hashed out and reconciled. Working under enormous time pressure with new members each day, the Adjudication Committee acquitted itself admirably, executing its task with efficiency and dispatch. After the final decisions were reached, policy parameters such as spending on health, education, coca eradication, military and police operations, etc., were entered into the NationLab:Bolivia 2001 simulation model and results were projected for the beginning of the next interval of play. The exercise was supported by a socio-economic simulation model of Bolivia. This model, named NationLab:Bolivia, was written by Dr. Loren Cobb specifically for the NationLab exercises of USSOUTHCOM. It has components that simulate the formal and informal economy of Bolivia, its demographics, educational and public health systems, the local narcotrafficking industry, and the coca farmers. It also has a component which models corruption of the civil service. This latter component is experimental and under continuing development. Data for current conditions in Bolivia were provided by the Government of Bolivia, students of the EAEN, the World Bank, the International Labor Organization (ILO), the United Nations (UN) and its International Council for Education Funds (UNICEF). The purpose of the model is to provide the dynamics of the vicious cycle between poverty, corruption and narcotrafficking, as well as the education system, the formal and informal economies, the labor force, public health, and demographic processes. The outline of these dynamics were first identified in 1998 by faculty and students of the La Paz campus of the EAEN, and their seminar work continues to inform and guide the development of the NationLab:Bolivia simulation. Dr. Oscar Antezana, a Bolivian economist working at the time for USAID, developed the core of the micro-economic narcotrafficking database in the early 1990s. The economic and labor components of NationLab:Bolivia are based on contemporary research and modeling in the field of developmental economics, with certain aspects that are original with NationLab:Bolivia. The education and demographic components are standard flow models in common use around the world. The corruption component is original to NationLab:Bolivia, and was designed by Dr. Cobb to capture essential aspects of civil service corruption, including the extent to which promotion is based on merit, civil servants are career professionals, salaries are adequate, and bureaucrats are held responsible and accountable for their actions. The NationLab:Bolivia 2001 simulation model is used to project consequences of policy decisions taken by players in the exercise over a period of time that can vary from one to three years. Policy parameters decided by the adjudication committee during the exercise are entered into NationLab:Bolivia at the end of each day. The model is then run forward for the required number of years, and the results are plotted and tabulated. These results are briefed to all participants the next morning, and thus become the starting conditions for the next day of the exercise. Less than half of all policy decisions can be quantified sufficiently accurately to be used in a computer-based simulation. Therefore, the NationLab simulation model is used only in those areas where quantification is generally successful. The demographic and education components, for example, are quite accurate. The economic and labor-force components are somewhat less accurate, but still very useful for medium-term projections. The component that deals with narcotrafficking is only as good as the data on which it is based. In recent years that data has been of reasonable quality, which is reflected in the operation of the model. The corruption model is still very experimental, but it has served surprisingly well given the lack of extensive research in this area. The first days scenario (2001-2002) was based on the current, real-life situation of a new presidency (that of Jorge Quiroga), which came into power because of the illness of the previous incumbent, and which will last only one year before a new government will transition to power. Government role-players were charged with trying to use this year to improve the image and prestige of the presidency, and asked to concentrate on reducing corruption and fighting poverty as its principal objectives. Economic recession influenced by the Asian crisis, the devaluation of the Brazilian real, reduction of prices for Bolivian exports, rising of international oil prices, the cessation of natural gas exports to Argentina, and other negative economic factors including the events of Sept. 11 in the U.S.
Climatic effects (El Niño, La Niña), the reduction of coca production, and the reform of Customs, which by diminishing contraband has placed more pressure on workers in the informal economy sector. Recession in many of Bolivias main industries: mining, construction, and manufacturing. The only industries that were still doing well were natural gas and telecommunications. The disaffected groups in the country  campesinos, cocaleros, unemployed workers and others who feel marginalized  were waiting to see how this government will perform, and were willing to give it some grace time, but they will not give up their demands for improvements over the long term. Crime and narcotrafficking were somewhat on the increase, despite the governments earlier success in the eradication of excess coca plantations. The narcotrafficking industry was finding new ways of growing, processing, and transporting coca products. In several zones in the country, cocaleros were refusing to have their crops eradicated, and were taking violent action against military and police personnel, using firearms and explosives. Outside influences, well financed by an international narcoterrorist organization, were stirring up trouble among the local populations of campesinos and cocaleros. The administration in this scenario chose to adopt several aggressive and innovative strategies to achieve their objectives and face their challenges. They also had to take into consideration the activities of the Threat Group. The threat group decided that the cocaleros would give an ultimatum and threaten to blockade roads (a real life threat), truck drivers would demand improved road construction, and certain cocaleros would through harassment bring a stop to the governments eradication efforts. This was a very ambitious administration, with many plans for new programs and policies, tackling many issues. During the adjudication process, the government had to face the fact that they did not have enough funds to finance all of these changes and that only some of them were going to be successful. Some support was given to help small businesses, in particular changing financing, banking and taxation laws so that credit would be easier to obtain. A new legal code was introduced to start creating over time a universal taxation system. Some reserve funds were available for improving road construction, though not enough. A program was developed to strengthen municipal government, with both national and international funds. Hopefully this will improve individual pay and discourage corruption. Initiatives to diminish discrimination on the basis of gender were introduced. This might help particularly for the native Indian women to get better jobs. Programs were introduced to improve public health through preventive medicine and improved sanitation, and to reform the educational system. The military deployed extra forces to help fend off civil disruption. A program was started to help farmers market alternative crops more successfully  however it was under funded and only partially successful. An initiative was made in privatizing some national industries, to provide income for the government and more imaginative industrial leadership. The military asked for, but did not receive any new equipment in the face of increasing threats. Although some arrests were made, many people involved in acts of violence and other crimes were not apprehended and brought to trial. There were no funds to implement the Agricultural Reform Law. A program to improve sustainable development and the environment could not be funded. The country was unable to fund a counter-terrorism plan and became vulnerable to future acts of narcoterrorism. Although considered, a white collar prison system was not introduced, which exacerbated the prosecution of some high level citizens. The students failed to fully understand and implement policies to attract foreign investment for crop substitution infrastructure development, e.g. U.S. Puerto Ricos Fomento Industrial program in which it grants a ten-year tax exoneration incentive. The NationLab:Bolivia 2001 computer simulation showed that this administration did make some progress which should produce results in the long term  particularly with the establishment of a universal taxation system, improvements in the health system, educational reform, and support for small businesses. However, serious corruption still continued to plague the country, and there was an immediate threat of civil unrest, particularly from the narcotrafficking industry. More demonstrations, blockades, and armed conflict were anticipated. The political future of this government was very uncertain because of this threat and the unpopularity of troop deployment, particularly in the Chapare. The immediate decision of the new President to withdraw Armed Forces troops from the Chapare region was met with approbation from the opposition groups although a temporary reduction in the threats of civil unrest and instability resulted. The President traveled to North America, Canada, Europe, and several Asian countries to seek international support. The international community promised economic support, due to the previous governments success in eradicating excess coca. This foreign aid was to be used for alternative development, the fight against extreme poverty, and if possible, against corruption. The European community promised close to $1 billion over the coming five years, conditional on the national government demonstrating adequate transparency in the use of these resources. The United States decided to forgive some debt, in recognition of the success in the eradication of coca. It asked the Bolivian government to use the funds, which would have gone to pay the debt on a new Plan of Social Investment. The new government wished to concentrate on social and economic reform, which would fight poverty and corruption, while downplaying the problems of narcotrafficking. However, within a short time, the Threat Group posed additional complications for the new government. 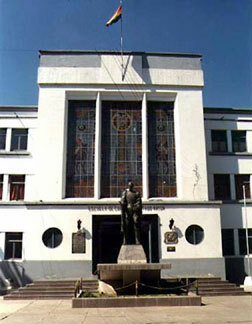 Without opposition from the Armed Forces, the cocalero organization was growing stronger, and developed an even longer list of demands. So did the campesinos, who demanded more land. Even though the government agreed to 70% of these demands, the opposition leaders rejected a compromise, threatened new blockades and civil unrest, and interrupted the progress of construction and education. Efforts of the government to unseat the leader, Evo Morales, failed. A new program was implemented to start a professional, paid civil service. While this will take a while to implement, it should ultimately reduce corruption. Increased economic support to small businesses resulted in increased employment, with positive results for the economy. This included a reduction in the lending rates, so that small businesses were helped. Educational reforms improved the school attendance of girls and improved training in agricultural technology. Preventive health measures were put in place. While insufficient to handle all health problems, these did succeed in reducing both infant and maternal mortality rates. Troops from security-drug eradication forces were now involved in civic action programs, including improvement of the infrastructure and agricultural training. This was somewhat helpful, especially in improving the public image of these forces. Municipal governments continued to be given more funds from national and international sources, spreading resources throughout the country and slightly reducing corruption. A new program was initiated which would make it possible for small farmers to obtain title to land, and generally reduce bureaucratic barriers. Although more international funds became available, the government had to practice strong fiscal austerity in order to reduce costs and pay for the new programs. These austerity measures were not popular. The goal for the universal taxation system, which was to reach 20% implementation during this period, was not met. Only 10% implementation occurred, thus reducing expected government income. With the more lax approach to eradication, the production of coca rapidly began to increase, and some international aid, which was conditional on coca eradication, was threatened. The rate of inflation began to grow, threatening to cancel out other positive economic changes. With no government forces to oppose them, the cocalero opposition was growing, and there was an emerging threat of narcoterrorism. The Threat Group was not willing to negotiate, and heavy civil unrest was anticipated. There were fears that opposition forces would prevail, leading to insurrection and possibly civil unrest that could lead into a revolution. This government achieved several successes, which were expected to create long-term improvements. Even though the universal tax system was not yet in place, real progress had been made. This, along with the creation of a professional civil service, would over time go a long way towards reducing corruption. Programs, which supported and improved health services, education, housing, infrastructure, and small businesses were in place and progressing, and would also produce good results over time. Some sectors of the population were beginning to feel more trust in the government. However, the press minimized these successes. Because the results were neither immediate nor obvious, the press concentrated on the immediate threats which faced this government: the increase in narcotrafficking and the threat of narcoterrorism, the potential loss of foreign aid and investment because of these threats, and the dramatic increase in the rate of inflation. Politically, the stability of this government was at risk, and some in the country were anticipating major conflict. The third and final day of the exercise covered a three-year period from 2004-2007. The scenario provided several very negative and difficult factors to be dealt with. These were not necessarily the result of the previous administrations policies, but represented a pessimistic scenario designed to challenge the students strategic planning skills during the exercise. A grave deterioration in the national economy, with a rate of inflation shooting up to 35% in the last six months. Increase in unemployment and criminal activity. Strong civil unrest with threats of road blockades and paralysis of the national transport system, resulting in a general sense of impending anarchy. Intransigent opposition groups, aggravated by the action of political agitators of known extremist orientation, who were unwilling to compromise with the government or to keep agreements they had previously signed. The abandonment of the fight against narcotrafficking over the previous two years, which had resulted in a dramatic increase in coca production, contraband, and a general increase in criminal activity and the threat of narcoterrorism. An increase in corruption, with governmental officials and human rights groups protecting both the cocaleros and armed bands from prosecution. Partial reduction of foreign aid from the European Union because of the above circumstances; instead of the planned $1 billion, they gave only half that amount. The government of the United States suspended economic cooperation, justifying its action on the grounds that the fight against narcotrafficking had been abandoned by the government of Bolivia. The new administration, wishing to avoid economic collapse and civil war, decided to take a very hard-line approach to the current problems of the nation. They imposed a strong military presence in the areas of conflict, gave greater powers to the justice system to deal with offenders and agitators, and reduced the ability of the press and human rights organizations to monitor government actions. They also took a strong moral stance against corruption of any kind. The Threat Group further complicated the already very difficult situation by introducing an act of terrorism: sending what was falsely claimed to be anthrax powder in the envelope containing their list of demands to the Cabinet. The government took a hard line stance against acts of terrorism and refused to negotiate with the opposition group because of the anthrax. Public opinion moved from support of the opposition towards support of the government. The Armed Forces returned to the Chapare and started to reinforce the eradication of coca at a steady rate, thus seriously injuring the narcotrafficking industry. Emergency Zones (de facto military zones) were established in the Chapare, Yungas and Altiplano. In the first year of this administration, police and military forces were able to reestablish order. Later, however, citizens began to question the use of force and possible abuses of human rights. The penal system was strengthened, with more transgressors apprehended and new jails built to hold them. Thus the rule of law was upheld, although the expense and efficacy of the jail system was later brought into question. A major change in monetary policy, plus better fiscal control of expenditures, reduced the rate of inflation to a manageable level. The new fiscal policy also supported and improved the export market of Bolivia, thus strengthening its economy. A national anti-terrorism agency was established, with the support of the international community. The government also continued several policies of the previous administration, which started to produce the long-term social and economic improvements that had been hoped for. In particular, the implementation of a professional civil service continued, as did educational reform, improved preventive medicine, training in agricultural technology, the implementation of a universal tax system at a slow but steady rate, and improved support to small businesses. These social and economic policies were seen as beneficial over the long term (about 20 years) even though the strength of their potential impact was not immediately felt, and improvement was gradual. Also, the military continued to participate in civil activities, such as improvement of the infrastructure and aid to communities. The reestablishment of the military draft, while useful in providing enough troops to handle the immediate crisis, was not popular. Lack of modern equipment in the military continued to be a problem. A new intelligence system, set up by the government, did not work initially. The international community objected to its potential misuse against legitimate domestic political opposition. The development of this system was delayed, subject to more scrutiny and international funding. The military restricted the press in the Emergency Zones, an action which aroused both national and international criticism. This triggered investigations of alleged human rights abuses by the International Committee of the Red Cross and other international human rights agencies, and several nations renewed their threats of withholding international aid. The expense of the new jail system was criticized. It was perceived as continuing a corrupt mechanism by which wealthy prisoners would be sent to country club jails, while all others would be treated harshly. Overall, this administration succeeded in reestablishing order and returning to the Coca Zero policy. The immediate threats of blockade and economic paralysis were averted. The administration also put in place some critical economic reforms that brought the inflation rate back under control. More importantly, the government also made a commitment to continue those social and economic programs, which over the long term would aid the country in escaping the vicious cycle of poverty, narcotrafficking and corruption. On the other hand, much of the population remained uncomfortable with the use of military force. They questioned the necessity of restrictions on the press and human rights organizations. There were international investigations of possible human rights abuses, and more insecurity about the availability of international aid. At the end of the game, cocaleros still felt that their economic needs were not being met in any effective way, and although the paralyzing protests were ended there were still demonstrations on going. Bolivia had survived a difficult six years, but still had considerable milestones to achieve. This three-day exercise gave EAEN students the opportunity to explore the policy implications of poverty, corruption and narcotrafficking in exhaustive detail. They were able to invent and test a variety of policies and strategies, and to see how successfully they might play out over time. They were forced to confront economic, social and political realities in their evaluations of the effectiveness of their executive decisions. By the end of the exercise, the dynamic complexity of the vicious cycle was fully appreciated by participants and observers alike. Although there were no simple solutions, numerous interesting and fruitful discussions had been triggered, and most seemed to come away with a deeper understanding of the challenges and strategies for countries caught in similar vicious cycles. The immediacy of the current political situation in Cochabamba during the period of the exercise enhanced its relevance and interest. The visit into the Chapare gave the students a direct appreciation of the challenges faced by the military and police in the eradication effort, including hostilities from the narcotraffickers. Real-life demonstrations that occurred in the streets near the Command and General Staff College, the NationLab game site, were a graphic reminder of the problems of narcotrafficking, poverty and corruption. On one day, cocaleros were meeting to protest the eradication effort, to demand increased coca production (un campo de coca para cada familia) and to threaten blockades. On another day, workers from Lloyd Aereo Boliviano were meeting to protest the corruption in the air industry and the justice system, which had allowed managers to allegedly steal money from the company and to escape from prosecution. Interestingly, on the very day that the third administration decided to clamp down on civil rights, the International Committee of the Red Cross actually showed up in Bolivia to demand an interview with Bolivian government cabinet members on the possibility of human rights abuses in the Chapare. Thus, the students were able to see how closely the exercise was mirroring current reality. The merging of the three branches of the EAEN into a unified exercise was a clear success. Student morale appeared high, and they seemed to enjoy and benefit from their mutual collaboration. Students from very different professional backgrounds, orientations, and physical locations were forced to discuss and hash out their differences in order to create workable policies. The spirit of competition helped these students, an already highly intelligent and motivated group, to excel in their preparation for the exercise. They came prepared with detailed charts, research reports, and dissertations on their chosen roles, ministries, and fields of expertise. This greatly enhanced the success of the entire exercise. The extremely successful visit to the Chapare gave all the students a sense of togetherness and importance in confronting a serious problem, which faces their nation. Even more than in previous years, the students and faculty of the EAEN were able to make the exercise their own, using personnel from USSOUTHCOM as, again, facilitators, and creating their own agenda for solving the problems of their country. This was the first NationLab exercise to which distinguished visitors were invited. They came from Peru, Paraguay, Mexico, and the Inter-American Defense College in Washington, DC. Their presence was greatly appreciated, enhanced the professionalism of student participation, and encouraged members of the Bolivian team who have been working on this project for several years. Initial evaluation shows that visitors were very interested the NationLab concept, design and exercise. Visitors from Peru and Paraguay have already committed their respective national higher learning institutes in developing a similar exercise in their countries for 2002. The Inter-American Defense College has also agreed to sponsor some form of the NationLab exercise as part of its training for calendar year 2002. As a methodology and set of tools for facilitating the development and refinement of a national security strategy for a developing Latin American nation, the US Southern Command NationLab approach has demonstrated its utility for four consecutive years in Bolivia. El objetivo propuesto busca un enfoque a dos vías, los Ejercicios del Consejo de Seguridad Nacional por un lado y foros Académicos cuyas equivalencias de nación anfitriona serían similares a la Universidad de la Defensa Nacional de los Estados Unidos en el otro. La metodología del NationLab debería de funcionar con otras escuelas de altos estudios de similar ubicación en Estados Unidos y América Latina, por ejemplo, el Colegio Interamericano de Defensa (IADC), Washington, DC, Estados Unidos y en estos países: Perú, Paraguay y Colombia; de estos, Perú y Paraguay ya se comprometieron a desarrollar su primer ejercicio de NationLab. The proposed objective follows a two-pronged approach, with National Security Council Exercises on one prong and Academic forums at host-nation equivalents of the US National Defense University on the other. The NationLab methodology should work with other similarly-situated US and LATAM schools of higher learning, e.g. the US Inter-American Defense College and these nations: Peru, Paraguay, and Colombia with Peru and Paraguay already committed for their first NationLab exercises. US NSS addresses transnational threats, which may or may not apply entirely to some of the regional partner nations. The recommended solution is to bring other countries who would be involved in a regional security-building exercise up to a level of familiarity and confidence akin to Bolivia, by way of a series of bilateral national security exercises, including sending observers to more experienced NL EAEN, conducted in a manner similar to the exercise described in this report. Some funding issues remain unresolved. The USSOUTHCOM Security Assistance Office should plan and request Traditional CINC Activities (TCA) funding to initiate the bilateral process. An eventual funding source could be Joint Chiefs of Staff (JCS) directed exercises similar to those the command currently executes, i.e. Peacekeeping Operations and Humanitarian Assistance Command Post Exercises (CPX). Due to its smaller scale, a regional NationLab exercise would cost only a fraction of a large CPX. Participants from the La Paz campus of the EAEN. Participants from the Cochabamba campus of the EAEN. Participants from the Santa Cruz campus of the EAEN. The economy of Bolivia during the six years of the exercise. Coca production and cocaine export during the exercise. The labor sectors of Bolivia during the exercise. Progress against corruption during the exercise. Educational indicators during the exercise. A few of the NationLab controls.